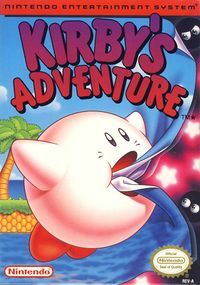 Kirby's Adventure (星のカービィ 夢の泉の物語, Kirby of the Stars: The Story of the Fountain of Dreams) is a 1993 platforming video game developed by HAL Laboratory for the Nintendo Entertainment System. The second game in the Kirby series, it also appears as a Masterpiece in Super Smash Bros. Brawl and Super Smash Bros. for Wii U. In Brawl, it can be played for 120 seconds and starts at Vegetable Valley. In Super Smash Bros. for Wii U, it can be played for 180 seconds and has two save files: one at the beginning of the game and another one at the final Dedede/Nightmare fight. However, it must be unlocked by clearing Solo Classic with Kirby on intensity 5.5 or higher. Meta Knight, a playable character in Brawl and Super Smash Bros. 4, first appeared in this game. While the origin of Kirby's neutral special move, Inhale, first appeared in Kirby's Dream Land, it was this game that gave Kirby the ability to copy enemies, which would become a recurring element in the Kirby series. Kirby's dash attack in Super Smash Bros. Melee is based on the Burning ability from this game. His side special move, Hammer, is based on the Hammer ability from this game. Like its lighter counterpart Sword, it comes with two different attacks: a heavy swing when used on the ground, and a somersault attack when used in midair or underwater. It can be obtained by inhaling Bonkers. Kirby's back throw is based on the Backdrop ability from this game. Also, one of Kirby's custom moves, Ice Breath, is based on Ice Kirby from this game. The Fountain of Dreams stage comes from the location of the same name in this game. It is the home of the Star Rod, which gives good dreams to the inhabitants of Dream Land. After the Star Rod was stolen and broken by King Dedede for safety purposes, Kirby had to collect the seven parts by traveling throughout the seven levels of the game. The Star Rod comes from this game. It acts as the primary power source of the Fountain of Dreams, and without it, people are unable to properly sleep or dream. Although initially broken into seven shards by King Dedede, Kirby restores the Star Rod, only to discover that Dedede had shattered the Star Rod in order to prevent the main villain of the game, Nightmare, from taking over the Fountain of Dreams; directly after this, Kirby is then tasked with using the Star Rod in order to defeat Nightmare, which he successfully performs. Nightmare appears as an Assist Trophy in Super Smash Bros. 4. He is the final boss of this game. Due to the threat he posed to Dream Land, King Dedede sealed away Nightmare by dismantling the Star Rod. Kirby, however, didn't know this was Dedede's intention, and re-assembled the Star Rod in full by defeating Dedede's minions and ultimately defeating the king himself at the Fountain of Dreams. Once the Star Rod was placed back in the fountain, Nightmare was released. Dedede then inhaled Kirby and fired him off to fight Nightmare. Bonkers, an enemy in Smash Run, first appeared in this game. In order to attack, Bonkers may charge at Kirby, jump in the air and swing his hammer, or throw coconuts at Kirby to deal damage. The "Butter Building" and "Butter Building Ver. 2" tracks come from this game. "Butter Building" is an electric guitar-based remix of a music piece that played in several levels of this game, first debuting in the Butter Building level, hence the name of the track. This track also features parts of the Star Jingle, Green Greens from Kirby's Dream Land, and the Kirby's Dream Land title screen music. The Ice Cream Island theme appears in Super Smash Bros. for Nintendo 3DS / Wii U.
Kirby's blue alternate costumes in all Super Smash Bros. games is based on Ice Kirby or Freeze Kirby. Additionally, his dark blue alternate costume in Super Smash Bros. for Nintendo 3DS / Wii U is based on Meta Knight. This page was last edited on April 27, 2016, at 22:41.